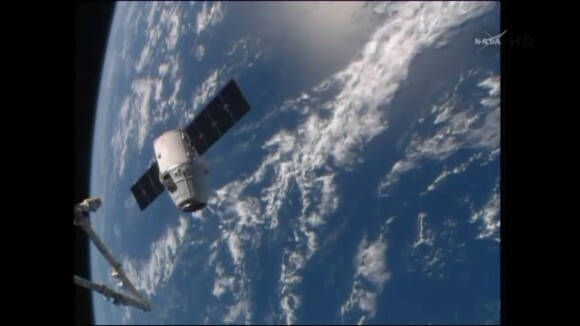 The SpaceX 3 Dragon commercial cargo freighter successfully arrived at the International Space Station (ISS) on Easter Sunday morning, April 20, as planned and was deftly captured by Expedition 39 Commander Koichi Wakata at 7:15 a.m. EDT at the controls of the Canadian built robotic arm. The next step due shortly is berthing of Dragon at the Earth facing port of the Harmony module at approximately 9:30 a.m. EDT. Berthing was officially completed at 10:06 a.m. EDT while the massive complex was soaring 260 miles above Brazil. This story is being updated as events unfold. The mission is the company’s third cargo delivery flight to the station. The Dragon vehicle loaded with nearly 2.5 tons of science experiments and supplies moved ever so slowly closely to within grappling distance – dramatically backdropped with gorgeous and ever changing scenery of our Home Planet sliding below. The million pound orbiting lab complex and free flying SpaceX Dragon were soaring some 260 miles above Egypt and the Nile River as the 57 foot long robotic arm grappled the resupply ship. Dragon was approximately 30 feet (10 meters) away from the stations hull at the time of capture. 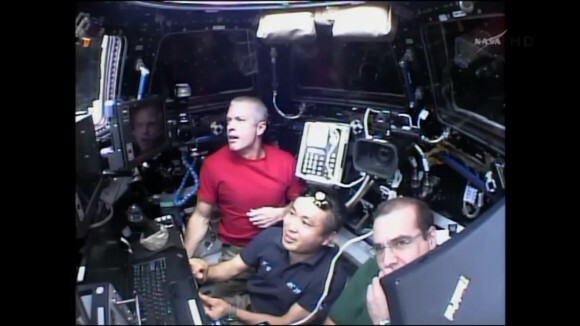 Wakata, of the Japan Aerospace Exploration Agency, was assisted by NASA astronaut Rick Mastracchio, while both were working from inside the 7 windowed Cupola robotics work station. Newly arrived NASA astronaut Steve Swanson observed the proceedings with a big smile. “Congratulations to the entire ops team for the successful launch, rendezvous and capture of Dragon,” Wakata radioed mission control moments after the successful grapple. 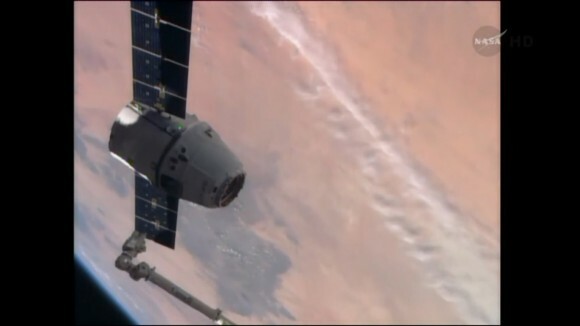 “Great work catching the Dragon, enabling fantastic science,” radioed Capcom Steve Fisher from NASA Houston Mission Control. Cheers and celebrations erupted at SpaceX Mission Control at the firms headquarters in Hawthorne, Calif.
Dragon arrived this morning following Friday afternoons, Apr 18, spectacular blastoff from Cape Canaveral, Fla, atop an upgraded SpaceX Falcon 9 booster. A two day orbital chase ensued with a series of critical engine burns targeting the ISS for Easter Sunday’s rendezvous and docking activities. Rick Mastracchio was at the controls for the actual berthing and latching in place at Harmony with Dragon’s Common Berthing Mechanism (CBM). The berthing process started at about 9:30 a.m. EDT. 4 latches were driven for 1st stage of capture. Followed by all 16 bolts and latches in total during second stage capture to firmly hold Dragon in place. The crew and mission control concluded the berthing procedure at 10:06 a.m. EDT flying over Brazil. The next step is for the crew to pressurize the vestibule connecting Dragon to station. Hatch opening is set to take place on Monday morning. It’s a busy week ahead for the six person international crew representing the US, Russia and Japan. A Russian Progress departs on Wednesday followed by the 2 person US spacewalk to replace the failed MDM unit. 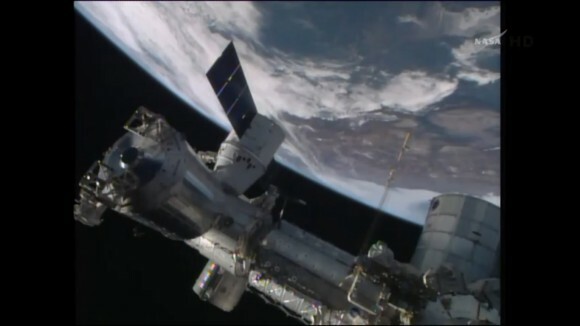 Dragon will remain attached to the station until May 18. This story is being updated. Check back. The SpaceX-3 mission marks the company’s third operational resupply mission to the ISS under a $1.6 Billion contract with NASA to deliver 20,000 kg (44,000 pounds) of cargo to the ISS during a dozen Dragon cargo spacecraft flights through 2016. There are over 150 science experiments loaded aboard the Dragon capsule for research to be conducted by the crews of ISS Expeditions 39 and 40. This unmanned SpaceX mission dubbed CRS-3 mission will deliver some 5000 pounds of science experiments, a pair of hi tech legs for Robonaut 2, a high definition Earth observing imaging camera suite (HDEV), a laser optical communications experiment (OPALS) and essential gear, the VEGGIE lettuce growing experiment, spare parts, crew provisions, food, clothing and supplies to the six person crews living and working aboard the ISS soaring in low Earth orbit under NASA’s Commercial Resupply Services (CRS) contract.